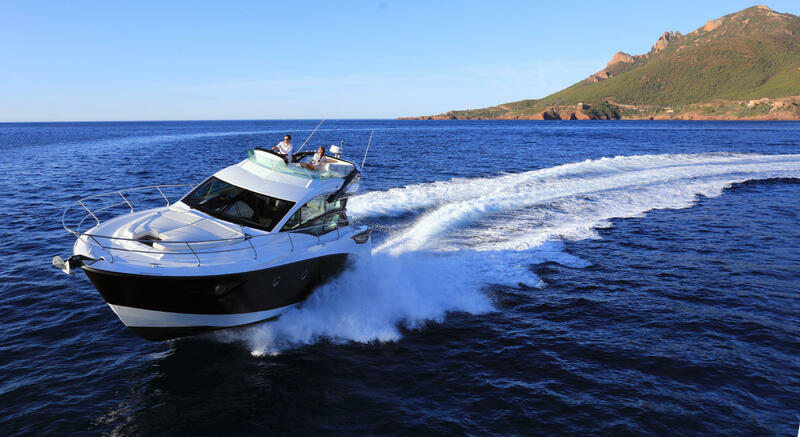 Enjoy the thrill of the Sportfly version of Beneteau’s flagship sport cruiser. Its second driving station has a spectacular view of the sea and, like many other details on this boat it is simply terrific! for a wide variety of water sports. Her style and materials are the hallmark of an exceptional boat, with deep pore walnut woodwork, padded and lacquered items, soft-touch leatherette upholstering, Corian® worktop to name but a few. Each material is rigorously selected and skilfully crafted. In the two cabin and ‘cosy saloon’ or three cabin version, the owner suite is bathed in light and boasts a very high level of comfort: full beam it accommodates an en-suite shower room, as well as dressing room-style storage. The fully fitted galley is reached by the portside companionway. Its atmosphere is bright and contemporary and it is wonderfully practical. The Gran Turismo 50 boasts larger than life sensations. She is sporty, comfortable and offers a feeling of freedom and space – setting new standards in sport cruising. Varnished Alpi Mahogany Interior Spacious Gourmet Galley. Our South Coast Yachts Service Department will provide you with initial yacht commissioning, warranty support, optional equipment additions, repairs, and routine preventative maintenance packages to ensure you enjoy the best possible ownership experience. South Coast Yachts, San Diego & Newport Beach Beneteau Dealer South Coast Yachts, San Diego & Newport Beach Beneteau Dealer shared a photo. A look back at 2018 and one of our greatest accomplishments....This Video!